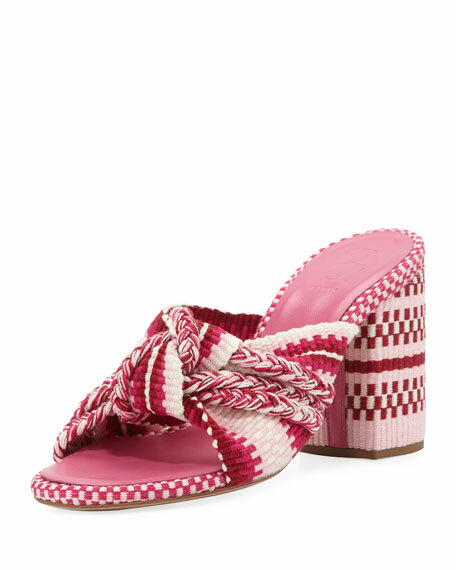 Alexandre Birman crocheted suede sandal. "Carmella" is made in Brazil. 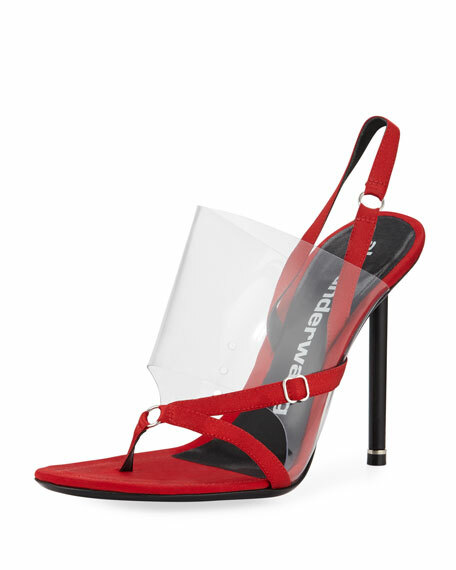 Alexander Wang asymmetric satin sandals with clear PVC-paneled vamp. 4" stiletto heel. Side-anchored thong strap. Adjustable slingback strap. Leather lining and sole. "Kaia" is made in Italy. Alexandre Birman "Vicky" leather and clear vinyl sandal. 4" covered heel. Knot detail at open toe. Transparent halter straps. Adjustable buckled closure. Leather lining and sole. Antolina "Biagia" sandals. Woven cotton upper. 3.7" covered block heel. Knotted strap bands open toe. Lamb leather insole. Calf leather sole. Slide style. Made in Italy.